The first film in the Star Wars Saga series was originally released. Created by George Lucas. The film series has spawned a media franchise outside the film series called the Expanded Universe including books, television series, computer and video games, and comic books. These supplements to the film trilogies have resulted in significant development of the series’ fictional universe. These media kept the franchise active in the interim between the film trilogies. The franchise portrays a galaxy that is described as far, far away in the distant past. It commonly portrays Jedias a representation of good, in conflict with the Sith, their evil counterpart. Their weapon of choice, the lightsaber, is commonly recognized in popular culture. 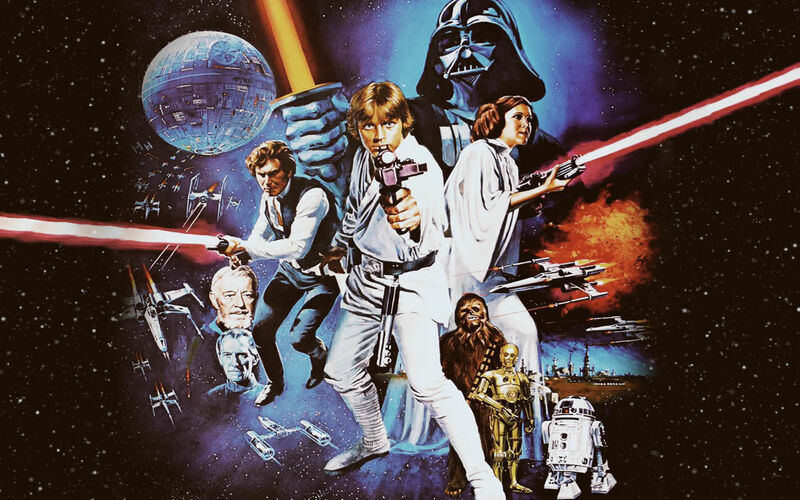 The fictional universe also contains many themes, especially influences of philosophy and , under the title Star Wars, by 20th Century Fox, and became a worldwide pop culture phenomenon, followed by two sequels, released at three-year intervals. Sixteen years after the release of the trilogy’s final film, the first in a new prequel trilogy of films was released. The three prequel films were also released at three-year intervals, with the final film of the trilogy released on May 19, 2005. In October 2012, The Walt Disney Company acquired Lucasfilm for $4.05 billion and announced that it would produce three new films, with the first film, Star Wars Episode VII, planned for release in 2015.20th Century Fox still retains the distribution rights to the first two Star Wars trilogies, owning permanent rights for the original film Episode IV: A New Hope, while holding the rights to Episodes I–III, V and VI until May 2020. Reactions to the original trilogy were mostly positive, with the last film being considered the weakest, while the prequel trilogy received a more mixed reaction, with most of the praise being for the final movie, according to most review aggregatorwebsites. All six of the main films in the series were also nominated for or wonAcademy Awards. All of the main films have been box office successes, with the overall box office revenue generated by the Star Wars films (including the theatrical Star Wars: The Clone Wars) totalling $4.38 billion, making it the fourth-highest-grossing film series.The success has also led to multiple re-releases in theaters for the series.Star Wars is an American epic space opera franchise centered on a film series created by George Lucas. The film series has spawned a media franchise outside the film series called the Expanded Universe including books, television series, computer and video games, and comic books. These supplements to the film trilogies have resulted in significant development of the series’ fictional universe. These media kept the franchise active in the interim between the film trilogies. The franchise portrays a galaxy that is described as far, far away in the distant past. It commonly portrays Jedias a representation of good, in conflict with the Sith, their evil counterpart. Their weapon of choice, the lightsaber, is commonly recognized in popular culture. The fictional universe also contains many themes, especially influences of philosophy and religion.The first film in the series became a worldwide pop culture phenomenon, followed by two sequels, released at three-year intervals. Sixteen years after the release of the trilogy’s final film, the first in a new prequel trilogy of films was released. The three prequel films were also released at three-year intervals, with the final film of the trilogy released on May 19, 2005. In October 2012, The Walt Disney Companyacquired Lucasfilm for $4.05 billion and announced that it would produce three new films, with the first film, Star Wars Episode VII, planned for release in 2015.20th Century Fox still retains the distribution rights to the first two Star Wars trilogies, owning permanent rights for the original film Episode IV: A New Hope, while holding the rights to Episodes I–III, V and VI until May 2020. Reactions to the original trilogy were mostly positive, with the last film being considered the weakest, while the prequel trilogy received a more mixed reaction, with most of the praise being for the final movie, according to most review aggregatorwebsites. All six of the main films in the series were also nominated for or wonAcademy Awards.All of the main films have been box office successes, with the overall box office revenue generated by the Star Wars films (including the theatrical Star Wars: The Clone Wars) totalling $4.38 billion, making it the fourth-highest-grossing film series.The success has also led to multiple re-releases in theaters for the series. Incidentally Frank Oz, who the voice of Yoda is, on May 25th his birthday Celebrates. The prequel trilogy begins with the Trade Federation blockading the planet Naboo, in response to theGalactic Republic’s taxation of trade routes. The Sith Lord Darth Sidious had secretly planned the blockade to give his alter ego, Senator Palpatine, a pretense to overthrow and replace the Supreme Chancellor of the Republic. At the Chancellor’s request, the Jedi Knight Qui-Gon Jinn and his apprentice Obi-Wan Kenobi are sent to Naboo to negotiate with the Federation, but are forced to instead help the planet’s monarch, Padmé Amidala, escape from the blockade and plea her case before the Galactic Senate on Coruscant. When their spaceship is damaged during the escape, they land on the desert planet Tatooine for repairs, where Qui-Gon discovers a young slave named Anakin Skywalker. Qui-Gon comes to believe that Anakin is the “Chosen One” foretold by Jedi prophecy to bring balance to the Force, and he helps liberate the boy. The Jedi Council, led by Yoda, reluctantly allows Obi-Wan to train Anakin after Qui-Gon is killed by Palpatine’s first apprentice, Darth Maul, during the Battle of Naboo.The remainder of the prequel trilogy chronicles Anakin’s gradual fall to the dark side of the Force as he fights in the Clone Wars, which Palpatine secretly engineers to destroy the Republic and lure Anakin into his service. Anakin and Padmé fall in love and secretly wed, and eventually Padmé becomes pregnant. Anakin has a prophetic vision of Padmé dying in childbirth, and Palpatine convinces him that the dark side holds the power to save her life; desperate, Anakin submits to the dark side and takes the Sith name Darth Vader. While Palpatine re-organizes the Republic into the tyrannical Galactic Empire—appointing himself Emperor for life—Vader participates in the extermination of the Jedi Order, culminating in a lightsaber battle between himself and Obi-Wan on the volcanic planet Mustafar.Obi-Wan defeats his former apprentice and friend, severing his limbs and leaving him for dead. Palpatine arrives shortly afterward and saves Vader, placing him into a mechanical suit of armor that keeps him alive. At the same time, Padmé dies while giving birth to twins Luke and Leia. The twins are hidden from Vader and are not told who their real parents are. American essayist, lecturer, and pot Ralph Walo Emerson was born (May 25, 1802. He led the ranssendentalistmovement of the mid9th century ad was seen asa champion of individualism nd a prescient critic of the countervailing pressures of society, nd he disseminated is thoughts through dozens of published essays and more than 1,500 public lectures across the United States.Emerson gradually moved away from the religious and social beliefs of his contemporaries, formulating and expressing the philosophy of Transcendentalism in his 1836 essay,Nature. Following this ground-breakingwork, he gave a speech entitled “The American Scholar” in 1837, which Oliver Wendell Holmes, Sr. considered to be America’s “Intellectual Declaration of Independence”.Emerson wrote most of his important essays as lectures first, then evised them for print. His first two collections of essays – Essays: First Series and Essays: Second Sries, published respectively in 1841 and 1844 – represent the core of his thinking, and include such well-known essays as Self-Reliace, The Over-Soul, Circles, The Poet andExperience. Together with Nature, these essays made the decade from the mid-1830s to the mid-1840s Emerson’s most fertile period. Emerson met his first wife, Ellen Louisa Tucker, in Concord, New Hampshire on Christmas Day, 1827, sadly Ellen died at the age of 20 on February 8, 1831, After his wife’s death, he began to disagree with the church’s methods, writing in his journal in June 1832: “I have sometimes thought that, in order to be a good minister, it was necessary to leave the ministry. The profession is antiquated. In an altered age, we worship in the dead forms of our forefathers.” His disagreements with church officials over the administration of the Communion service and misgivings about public prayer eventually led to his resignation in 1832. As he wrote, “This mode of commemorating Christ is not suitable to me. That is reason enough why I should abandon it. As one Emerson scholar has pointed out, “Doffing the decent black of the pastor, he was free to choose the gown of the lecturer and teacher, of the thinker not confined within the limits of an institution or a tradition. Emerson toured Europe in 1833 and later wrote of his travels in English Traits (1856). He left aboard the brig Jasper on Christmas Day, 1832, sailing first to Malta.During his European trip, he spent several months in Italy, visiting Rome, Florence and Venice, among other citiesMoving north to England, Emerson met William Wordsworth, Samuel Taylor Coleridge, and Thomas Carlyle. Carlyle in particular was a strong influence on EmersonEmerson returned to the United States on October 9, 1833, and lived with his mother in Newton, Massachusetts, until October, 1834, when he moved to Concord, Massachusetts, to live with his step-grandfather Dr. Ezra Ripley at what was later named The Old Manse.Seeing the budding Lyceum movement, which provided lectures on all sorts of topics, Emerson saw a possible career as a lecturer. On November 5, 1833, he made the first of what would eventually be some 1,500 lectures, discussing The Uses of Natural History in Boston. This was an expanded account of his experience in Paris. Plans were announced in November 1842 to find “a farm of a hundred acres in excellent condition with good buildings, a good orchard and grounds”and a 90-acre (360,000 m2) farm was purchased in Harvard, Massachusetts, in May 1843 for what would become Fruitlands, a community based on Utopian ideals inspired in part by Transcendentalism. The farm would run based on a communal effort, using no animals for labor; its participants would eat no meat and use no wool or leather. In 1844, Emerson published his second collection of essays, entitled “Essays: Second Series.” This collection included “The Poet,” “Experience,” “Gifts,” and an essay entitled “Nature,” a different work from the 1836 essay of the same name.Emerson made a living as a popular lecturer in New England and much of the rest of the country. He had begun lecturing in 1833; by the 1850s he was giving as many as 80 per year.Emerson was introduced to Indian philosophy when reading the works of French philosopher Victor Cousin.In 1845, Emerson’s journals show he was reading the Bhagavad Gita and Henry Thomas Colebrooke’s Essays on the Vedas.innovative poetry collection Leaves of Grass in 1855 Emerson was strongly influenced by the Vedas, and much of his writing has strong shades of nondualism. One of the clearest examples of this can be found in his essay “The Over-soulFrom 1847 to 1848, he toured England, Scotland, and Ireland.He also visited Paris between the February Revolution and the bloodyJune Days. When he arrived, he saw the stumps where trees had been cut down to form barricades in the February riots. On May 21 he stood on the Champ de Mars in the midst of mass celebrations for concord, peace and labor. He wrote in his journal: “At the end of the year we shall take account, & see if the Revolution was worth the trees.” The trip left an important imprint on Emerson’s later work. His 1856 book English Traits is based largely on observations recorded in his travel journals and notebooks. Emerson later came to see the American Civil War as a ‘revolution’ that shared common ground with the European revolutions of 1848In February 1852 Emerson and James Freeman Clarke and William Henry Channing edited an edition of the works and letters of Margaret Fuller, who had died in 1850. In 1855 an innovative poetry collection Leaves of Grass was published. in 1855 Emerson was introduced to Indian philosophy when reading the works of French philosopher Victor Cousin. Emerson was staunchly anti-slavery and from 1837 give a number of lectures during the pre-Civil War years, b from 1844 on, he took a more active role in opposing slavery. He gave a number of speeches and lectures, and notably welcomed John Brown to his home during Brown’s visits to Concord. Once the American Civil War broke out, Emerson made it clear that he believed in immediate emancipation of the slaves. Around this time, in 1860, Emerson published The Conduct of Life, his seventh collection of essays. In this book, Emerson “grappled with some of the thorniest issues of the moment,” and “his experience in the abolition ranks is a telling influence in his conclusions.” These essays also find Emerson strongly embracing the idea of war as a means of national rebirth: .Emerson visited Washington, D.C, at the end of January 1862. He gave a public lecture at the Smithsonian on January 31, 1862, and declared: “The South calls slavery an institution… I call it destitution… Emancipation is the demand of civilization”. The next day, February 1, his friend Charles Sumner took him to meet Lincoln at the White House. Lincoln was familiar with Emerson’s work, having previously seen him lecture.Emerson’s misgivings about Lincoln began to soften after this meeting. In 1865, he spoke at a memorial service held for Lincoln in Concord: “Old as history is, and manifold as are its tragedies, I doubt if any death has caused so much pain as this has caused, or will have caused, on its announcement.” Emerson also met a number of high-ranking government officials, including Salmon P. Chase, the secretary of the treasury, Edward Bates, the attorney general, Edwin M. Stanton, the secretary of war, Gideon Welles, the secretary of the navy, and William Seward, the secretary of state.On May 6, 1862, Emerson’s protégé Henry David Thoreau died of tuberculosis at the age of 44 and Emerson delivered his eulogy. Emerson would continuously refer to Thoreau as his best friend, despite a falling out that began in 1849 after Thoreau published A Week on the Concord and Merrimack Rivers. Another friend, Nathaniel Hawthorne, died two years after Thoreau in 1864. Emerson served as one of the pallbearers as Hawthorne was buried in Concord, as Emerson wrote, “in a pomp of sunshine and verdure”. He was elected a Fellow of the American Academy of Arts and Sciences in 1864. The lead singer of German Rock group “the Scorpions”, Klaus Meine, celebrates his birthday today 25th May. The Scorpions were formed in 1965 by guitarist Rudolf Schenker, and are known for their 1980s rock anthem “Rock You Like a Hurricane” and many singles, such as “No One Like You”, “Send Me an Angel”, “Still Loving You”, and “Wind of Change”. On January 24, 2010, after 46 years of performing, the band announced that they will be retiring after touring in support of their new album Sting in the Tail and recently performed their last concert Live from Morocco. The late great American spy thriller writer Robert Ludlum was Born May 25th 1927. Most famous for writing The Bourne Identity, The Bourne Supremacy and the Bourne Ultimatum, He was very prolfc and wrote 23 thriller novels. Hs books reman hugely popular The number in print is estimated between 290–500 million copies. They have been published in 33 languages and 40 countries. Ludlum also published books under the pseudonyms Jonathan Ryder and Michael Shepherd. Ludlum was born in New York City. He was educated at The Rectory School then Cheshire Academy and Wesleyan University in Middletown, Connecticut. While at Wesleyan, Ludlum joined the Alpha Delta Phi fraternity. After becoming an author later in life, Ludlum would set his mystery novel Matlock Paper at the fictitious Carlyle University in Connecticut, a thinly-disguised Wesleyan.